A two day AIS Symposium is coming up soon in St. Paul, MN. - $40 registration fee includes lunch and refreshments both days. From Asian carp to flowering rush, aquatic invasive species (AIS) are threatening Minnesota’s precious water resources and the communities that depend on them. Join local officials, scientists, natural resource professionals and concerned citizens to learn about the latest research on AIS management and the policy and legal implications of the approaches available today. It came perfectly timed for the "Hubbard Prairie Sleigh Festival" coming up on Sunday, February 26th. Both the Minnesota Bound Eagle Cam and the eagle cam in Decorah, Iowa are up and running again. The Minnesota nest is located in south central Minnesota and is about 75 feet in the air. "The Future of Minnesota's Waters"
"We heard Darby speak in January at the Detroit Lakes Legislative Summit. He was an excellent speaker with a terrific message." The Headwaters Center for Lifelong Learning will be sponsoring a program on "The Future of Minnesota's Water's" with Darby Nelson, author of "For Love of Lakes" and conservation activist. This presentation will be held on Tuesday, March 6, 2012 from 1:00 - 2:30 p.m. at the Northwoods Bank Community Room. This article was published in the Park Rapids Enterprise and given to us by COLA. Hubbard County Coalition of Lakes Association is committed to work that keeps our lake healthy and maintains lakeshore property values. In recent months we have learned that owners of Hubbard County water influenced properties account for about 60 percent of the total property value in Hubbard County and pay about 53 percent of the $29 million dollar county property tax. Most of us are also aware of studies that say lakeshore and river property values decline when there is a reduction in water quality. Aquatic Invasive Species (AIS) are impacting the water quality on many of Minnesota’s lakes. Many of us are aware of the problems that aquatic invasives cause, not only in reduced property value but also in the expense to control the invasive (if possible!) and the reduced ability for all to enjoy the lakes and rivers. There will be a program on "Property Tax Assessment Process in Hubbard County" that is being sponsored by the League of Women Voters Park Rapids on March 6th from 5:00 p.m.- 6:00 p.m. at the Park Rapids Library. This program is on the process of property valuation assessment, not with the merits or deficits of property taxation. As lake shore owners you are probably even more interested in anything relative to property taxes. “The Property Tax Assessment Process in Hubbard County”, a program sponsored by the League of Women Voters Park Rapids will take place in the library lower level meeting room on March 6, from 5 to 6 pm. Presenting will be Bob Hansen, the Hubbard County Tax Assessor. The program focuses on the process of property tax assessment itself and how consistency of valuations is accomplished. Questions from the audience will be welcomed. Refreshments will be available. A hardy crowd showed up to see the Old Time Ice Harvest demonstration in Itasca State Park today. The bright sunshine was beautiful, but didn't provide any heat on this extremely cold day with a cutting northwest wind. These photos were taken by Carolynne White. Her family used to harvest ice from Long Lake to be used in the summers back in the days when people had "ice boxes" instead of refrigerators. Carolynne still has the old tools they used to cut and move the ice blocks. 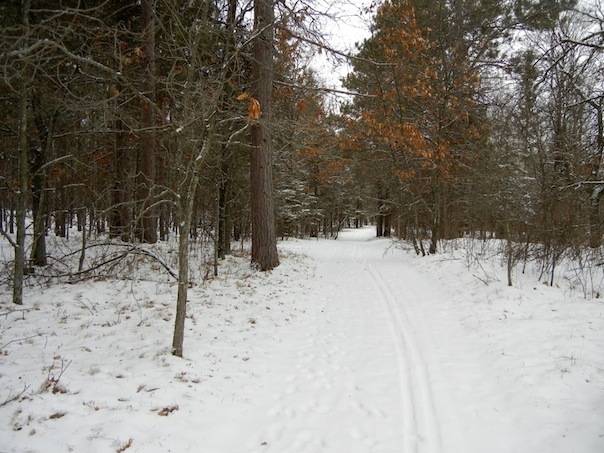 Offered by Itasca State Park and the Lake Itasca Region Pioneer Farmers. "Discover the good old days of harvesting lake ice. Dress warmly as you come out on Lake Itasca to see ice harvesters use tools of the ice cutting trade. Watch them create an opening in the ice with a single handled handsaw, then breathlessly wait as they bounce the ice blocks out of the water onto the slippery edge. NOTES: This Old Time Ice Harvest demonstration will take place on Lake Itasca if ice conditions permit. Parking is available at the Lake Itasca boat landing. 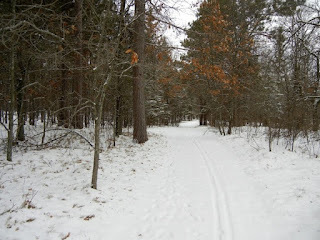 This event is presented by Itasca State Park and the Lake Itasca Region Pioneer Farmers." Directions: Entrance to the park is 21 miles north of Park Rapids on U.S. Highway 71. From Bemidji the park is 30 miles south on U.S. Hwy 71. 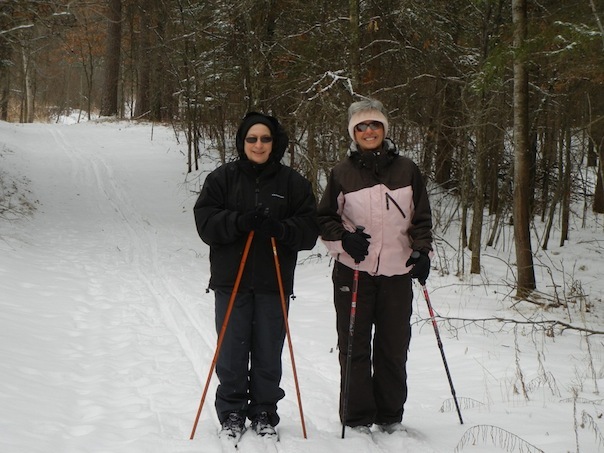 More Information: Contact Itasca State Park at (218) 699-7251 or by email at itasca.statepark@state.mn.us. The last couple of days have been beautiful, giving the illusion of a white winter. 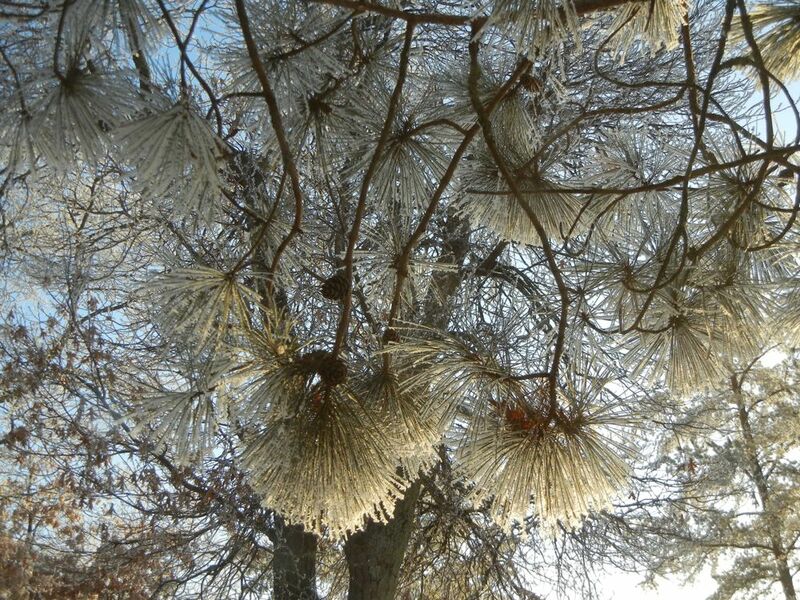 It did not snow but everything was covered in hoarfrost, formed from freezing fog painting a delicate landscape of mostly white with subtle shadows of faded colors and gray. 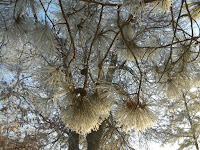 In the photos of the frost that I took this morning the sun has replaced the gray. 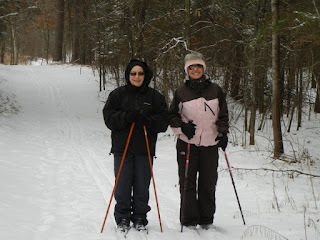 oh, yes - Despite little snow we have managed to get out cross-country skiing a few times. We've slid over pine needles here and there, but mostly there has been just enough snow to make getting out in the beautiful woods possible. Below are two photos from one such trek. Tonight (Saturday, Feb. 4, 2012) is this month's "Zorbaz Night" - an informal gathering for Long Lake neighbors. All are welcome.